Hi Simmi. Thanks for sharing on the Mrs Crafty B blog! How would you normally 'catch up' with friends? Well, having lived in London, I am rather partial to catch ups in pubs and restaurants... but now, I live in the Forest of Dean and have two young children, so it's usually a glass (or 4!) of Prosecco around the dining table while the kids play! Where to start? I am a 36 year old Mum of two (Seren is 7 and Patrick is nearly 6) and we have recently got a rescue puppy from Spain (Paella!) who keeps me on my toes. My lovely long suffering husband Brian toils away quietly in the background doing all the IT stuff my business requires. I run my business full time, but I am also a member of our local Amateur Dramatics group and the Chairwoman of the school PTA, so I'm always running somewhere and usually worrying about forgetting someone or something! Sounds crazy busy! What is the item you are sharing with us? 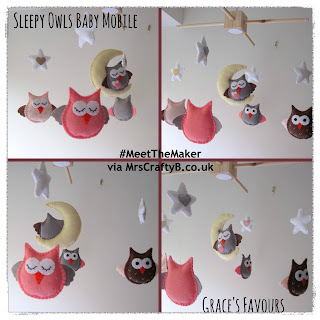 This is one of my newer items – an owl baby mobile. I have a number of different items in my shop – they range from Poppy brooches (of which a percentage of the profit goes to the Royal British Legion) to cuddly toys and children's room decorations, of which this mobile is one. The owls were one of the first patterns I designed and I've been meaning to make a mobile from them for, ohhh, about 3 years now! The moblie has 4 colour coordinating lager owls, each with a white & sparkly star and there's a smaller sleeping owl, sitting on the moon in the centre. With regards to the crafts and technique you have used to create you item, when and how did you learn these skills? Imagine making your own wedding dress! How amazing, I love that. What inspires and motivates you? I started sewing in ernest after I had Patrick and I was suffering from Post Natal Depression (in early 2011) and my GP suggested something craft related as a theraputic distraction really. I made Seren a little drawstring bag and a set of felt letters, so it's fair to say that most of what I make has roots in my children, what they're interested in, how I'd like (or now, more often how they'd like) their rooms decorated. Having cured my PND, I found that I am quite obsessed now with sewing and find if I don't sew for a couple of days, I get a bit twitchy, so there's no lack of motivation! I'm hugely lucky in that as part of our house renovation I ended up with a dedicated room, which is now referred to as my workshop! Mainly this came about because my husband was so fed up with all my sewing gear all over the house! Hehe, I know this conundrum. Hubby B gets sick of it. I am yet to get a dedicated workspace though. Might have to start leaving more stuff out and about. What is your favourite craft? Definitely sewing, but I've started needle felting and wet felting in the last year, so they are a close second. A decent pair of scissors is a must! And never, ever cut anything but material with them! I run my business almost entirely online, so if you were looking to start a craft business, I'd say make sure you are up to date with all the free marketing and advertising that's possible through social media (Facebook, Twitter, Instagram, Pinterest, etc) and if you wanted to sell your makes, Etsy is a wonderful place. There are loads of teams full of really friendly crafters and Etsy itself is a straight forward website to use, which is great for listing items quickly and easily – there's no sign up fee either, so it's great for testing the waters! I am working on a craft book, which I hope to get ready and published in the next 12 months – that's the most exciting thing at the moment! That is amazing! I would love to do that. You will have to send me some tips. ;-) So how about a quick fire round? Any box set I can find on Netflix, unless I'm editing photos and writing up patterns in which case rock music! My workshop (in my house) or further afield, India as I'm half Indian, so it always feels like home to me. Bringing up two happy, healthy and lovely children with the love of my life! Simmi it has been great finding out all about you (being right nosy basically) and I hope you will come back with an update when that book gets published!